Vol. 113 No. 41 - In our 113th year! 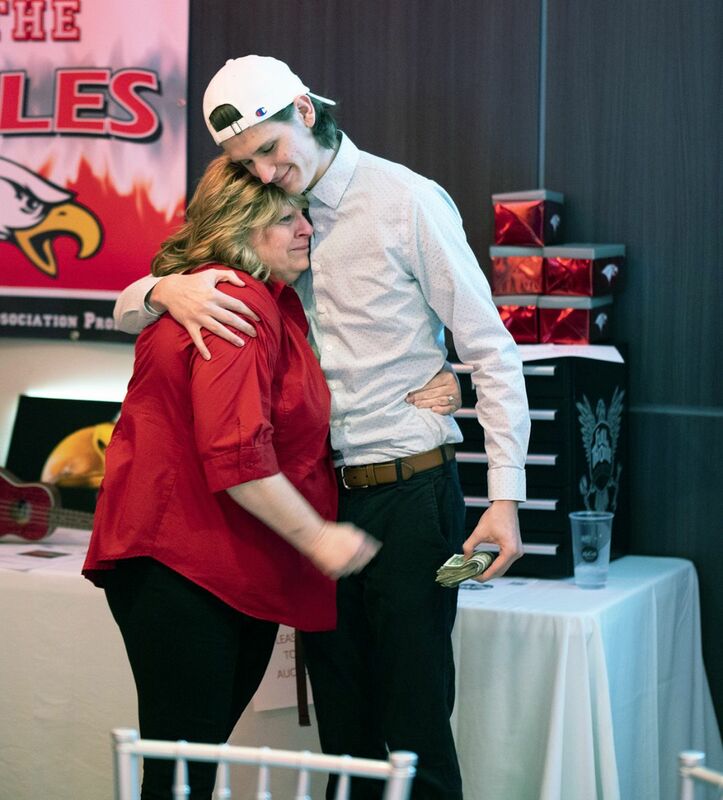 EMOTIONAL EVENING: The fourth annual Stand Up For The Eagles Auction, presented by Schaefer & Bierlein and organized by the Frankenmuth Athletic Association, drew nearly 200 persons. Above and left, Sandy Ragan and her son Adam react when given the proceeds from a 50/50 raffle. Sandy's husband Nick passed away suddenly earlier this year. Above and right, FAA President Frank Kotch presents a ukelele to Jo and Sean Clevelend, who were the winning bidders of the autographed instrument from Greta Van Fleet. 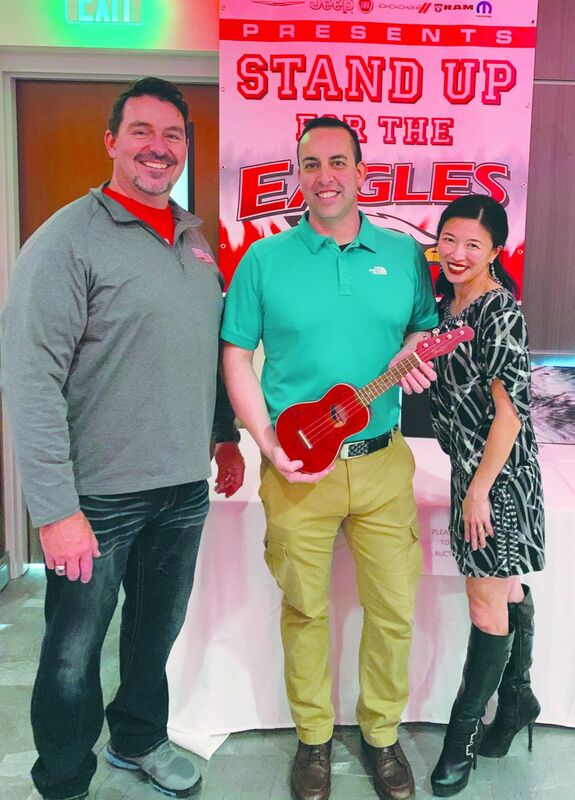 A change of venue was met with approval at the fourth annual Frankenmuth Athletic Association’s Stand Up For The Eagles Auction. Nearly 200 persons attended the event, held Friday evening, April 12, at the new Uptown North Main Banquet Center, located on the second level of the complex. The evening was filled with good food and beverages, gambling games of black jack, roulette and dice by Deke’s ParaDice & Casino, a wide variety of silent auction items and a spirited live auction led by the evening’s master of ceremonies, Frankenmuth’s Johnny Burke, morning radio personality at Classic Fox 103.9 FM radio. Once the auction committee went through some final numbers, FAA Auction Chairperson Kelly Campbell believes the goal of $50,000 was attained through the auctions, drink tickets, admissions and raffles. That number is in line with the past three years, bringing the four-year auction total to about $200,000. All proceeds benefit the Frankenmuth High School student athletes. In the past three years, the funds helped build a new weight room and a multi-purpose turf room in the FHS balcony. Some ideas this year include a therapy whirlpool for FHS Athletic Trainer Julie Felten and an east end pavilion for the FHS football field, among other “wish list” ideas from FHS Athletic Director Kevin Schwedler. The evening was also used to mark the 40th anniversary of the FAA. A special “President’s Choice” outdoor extravaganza featuring a grill and 39 other items needed for outdoor fun was put together. The package garnered nearly $2,000. In addition, special pilsner glasses, lanyards and t-shirts were also sold at the event to mark the 40th year. Frankenmuth-based band Greta Van Fleet donated a ukulele played at their Grammy Awards performance in February. That autographed instrument fetched over $1,200 for the cause. Campbell was pleased with the generosity shown at the auction. The committee gathered many exciting items to bid on, including a Beer Making 101 class at the Frankenmuth Brewery, a Chopped Champion style dinner at the Frankenmuth Farmers Market with Dietrich Bronner and a Costela Brazilian steak house dinner and wine tasting for eight people that garnered $1,700. Emotions were running high as the FAA dedicated their 50/50 raffle drawing to the family of Nick Ragan. “Nick tragically passed aweay earlier this year. Both Nick and his wife Sandy spent countless hours volunteering for the Muth Youth program and at the high school. We were honored to be able to present a small token of our appreciation to Sandy and her family,” Campbell stated. When the 50/50 raffle winner did not step forward, the family was given the entire amount of the raffle. Campbell also felt the change of location was great for the event. “Our new venue at Uptown North Main Banquet Center offered a fresh spin and Deke’s ParaDice & Casino gaming tables were a big hit with the crowd,” Campbell added. The auction committee thanks its sponsors and donors who "deserve huge praise for their unwavering support.” This year’s major sponsors were Schaefer & Bierlein, Frankenmuth Credit Union, Uptown North Main Banquet Center, Mike Young Buick GMC, Grasel Graphics, McDonald’s of Frankenmuth Bronner’s CHRISTmas Wonderland, Frankenmuth Insurance, Sign Pal, Coleen Hetzner Century 21, Emil Rummel Insurance Agency, Inc. 7-Eleven of Frankenmuth and Meijer Stores.